A work in Ottoman Turkish delineating the genealogy of the Ottoman Sultans, from Adam, the first human being and prophet, to Sultan Mehmed IV (d. 1687). Genealogy was a major component of political ideology among Islamic dynasties, and this text comes in a long line of similar works produced throughout the medieval period. The facsimile provides a way of introducing students to the multiple sources of political legitimacy used by medieval Muslim rulers. 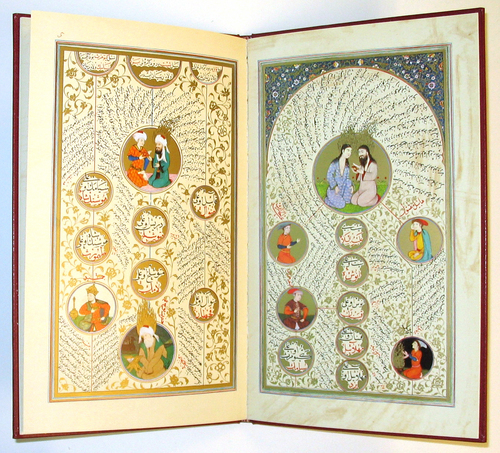 The manuscript’s artistic program allows one to see, even without the ability to read the text, that the Ottomans traced the legitimacy of their rule to a combination of divine sanction, Persian royal traditions, and the heritage of a spate of Muslim dynasties that had ruled the central Islamic lands before them. The manuscript’s series of pictorials begins with a portrait of Adam and Eve (fol. 4 verso), followed by numerous biblical (and other) prophets, Jesus, and Muhammad (fol. 8 verso). Portraits of prophets occupy the right and center of pages and are flanked, on the left, by legendary Persian kings and heroes celebrated as paragons of power and virtue in Islamic royal traditions. After Muhammad, the subjects of portraits change to religio-political figures from early Islamic centuries and rulers belonging to major dynasties. In this category, the manuscript depicts the first four caliphs, the Twelve Shi’i Imams, and rulers from Abbasid, Samanid, Ghaznavid, Saljuq, Mongol, and various Turkic dynasties. The absence here of the Umayyad and Timurid dynasties marks a significant ideological statement. The pictorial program eventually moves to the Ottoman dynasty in particular with the portrait of Usman Ghazi (fol. 13 recto, bottom), and then continues until Mehmed IV who is shown sitting on a throne with a Janissary soldier in the background (16 recto). The open pages (7 verso – 8 recto) are part of the pre-Islamic section and contain a number of figures interesting for both ideological and iconographic reasons. On 7 verso, the prophetic figures (indicated by the flaming nimbus around their heads) include Moses (with a staff), Aaron, Shu’ayb/Jethro, Samuel, and Daniel (writing on a scroll). The two remaining pictures may relate to any of the numerous Persian figures mentioned on the page. The portraits on 8 verso include David, Solomon, Zechariah, John the Baptist, Alexander the Great, and Jesus. The choices for headgear mark a significant distinguishing feature since all are shown with turbans except Alexander (who has a crown), and Jesus. Jesus’ lack of headgear and simpler attire reflects his image as a mendicant devoted to God. Students can further unpack the representations on this as well as other pages to reveal traditional ideas about the various figures being depicted. Osterreichische Nationalbibliothek. Manuscript A.F. 50. This entry was posted on April 11, 2012 by ASFC in Political Leaders, Spiritual Experiences and tagged Ottoman Empire, Subhad al-Akhbar, Twelve Imams.